The perpendicular drawn from the vertex of a triangle to its opposite side is called ‘altitude’. In the adjoining figure C is the vertex. CM is perpendicular to the opposite side AB (extended). (vertex A to the opposite side BC and vertex B to the opposite side AC). Note: Triangles have three altitudes. Three or more straight lines are said to be ‘concurrent’ if they all pass through a common point. This common point is called ‘point of concurrency’. 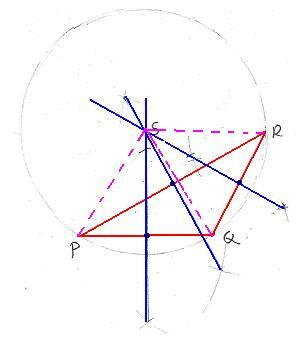 In the adjoining figure, lines AB, CD, EF and GH pass through a common point (intersection) O. Hence all these four lines are concurrent and O is the point of concurrency. Activity: Construct few triangles and draw altitudes from each of the vertex of the triangle. Did you observe that altitudes are concurrent lines? 2 points (if necessary extend the side) X, Y as shown in the figure. Step 3: With X and Y as centers, draw arcs (of radius more than half of XY) to cut at point Z. Step 4: Join C, Z to intersect the opposite side at L, CL is the altitude. 2 points (if necessary extend the side) H, G as shown in the figure. Step 6: With H and G as centers draw arcs (of radius more than half of HG) to cut at point I. Step 7: Join A, I to intersect the opposite side at N, AN is an altitude. at 2 points (if necessary extend the side) E, D as shown in the figure. 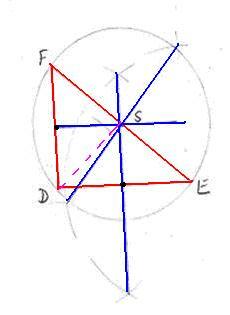 Step 9: With E and D as centers draw arcs (of radius more than half of ED) to cut at point F.
Step 10: Join B, F to intersect the opposite side at M, BM is an altitude. We notice that all the three altitudes intersect at a common point O. Let us observe the position of orthocenter in three different types of triangles (obtuse, acute and Right angled triangle). In figure 1, ABC is an obtuse angled triangle and its orthocenter O, is outside the triangle. 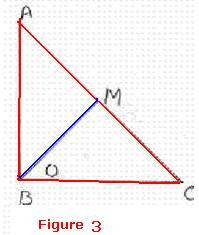 In figure 2, ABC is an acute angled triangle and its orthocenter O, is inside the triangle. In figure 3, ABC is a right angled triangle and its orthocenter O, is vertex of the right angle itself. 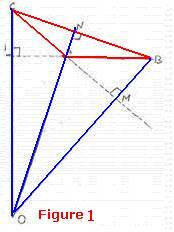 The line joining a vertex of the triangle to the middle point of the opposite side is called ‘median’. A, B, C are the three vertices. 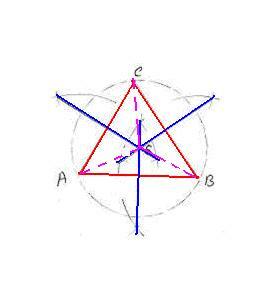 L, M, N are midpoints of AB, BC and AC respectively. The line CL joining the vertex (C) to the mid point (L) of opposite side AB is called median. The line AM joining the vertex (A) to the mid point (M) of opposite side BC is called median. 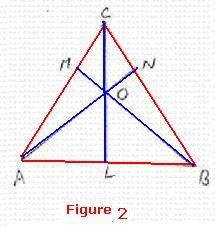 The line BN joining the vertex (B) to the mid point (N) of opposite side AC is called median. Step 1: Construct a triangle of given measurements (say AB = 5cm, AC = 5cm and CAB = 500). Step 2: Bisect side AB (Draw arcs of radius more than half the length of AB on both sides of AB). Let these arcs meet at X and Y. Step 3: Join X and Y to cut the line AB at L. Join CL. CL is the median. Step 4: Bisect side BC (Draw arcs of radius more than half the length of BC on both sides of BC). Let these arcs meet at P and Q. Similarly construct the median from Vertex B. Note: All the medians pass through a common point G.
The point of concurrence of the three medians of a triangle is called ‘centroid’ and is usually denoted by ‘G’. Let us look at the property of centroid for different types of triangles (Acute, Right and Obtuse angled triangles). 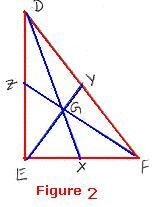 In figure I (Acute angled triangle), 2GH = AG, 2GI= BG, 2GJ=GC. In figure II (Right angled triangle), 2GX = DG, 2GY=EG, 2GZ=GF. Thus we conclude that the Centroid divides the median in the ratio of 2:1 with respect to the vertex and opposite side. Definition: The bisector of any side of a triangle is called ‘perpendicular bisector’. Step2: With A,B as centers draw arcs of radius more than half the length of AB on both sides of AB. Step4: With B,C as centers draw arcs of radius more than half the length of BC on both sides of BC. Step 5: Join PQ to meet BC at M.
Step6: With A,C as centers draw arcs of radius more than half the length of AC on both sides of AC. Let these arcs meet at T and U. Step 7: Join TU to meet AC at N.
Note that three perpendicular bisectors of a triangle are concurrent and they meet at S.
The point of concurrence of the perpendicular bisectors of the sides of a triangle is called ‘Circmcenter’ and is normally denoted by ‘S’ or ‘C’. We observe that any point on the perpendicular bisector XY is equidistance from both A and B, and hence the point S is equidistance from both A and B. Similarly any point on the perpendicular bisector PQ is equidistance from both B and C, and hence the point S is equidistance from both B and C.
So we observe that SA=SB=SC. If we draw a circle with S as center and SA as radius, we see that the this circle passes through all the vertices (A, B, C) of the triangle ABC. 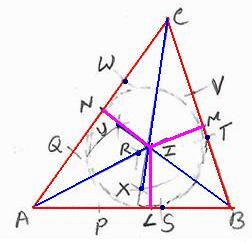 A circle which passes through all the vertices of a triangle is called ‘circumcircle’ of the triangle. Let us look at the position of circumcentre in three different types of triangles (acute, right and obtuse angled triangle). 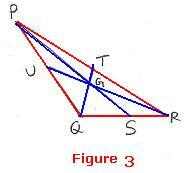 In figure 1, PQR is an obtuse angled triangle and its circumcentre S is outside the triangle. In figure 21, ABC is an acute angled triangle and its circumcentre S is inside the triangle. Step1: construct a triangle ABC with the given measurements. Step3: With P and Q as centers and with more than half of PQ as radius, draw arcs to intersect at R.
Step4: Join AR, this is the angular bisector of CAB. Step6: With T and S as centers and with more than half of TS as radius, draw arcs to intersect at U.
Step7: Join BU, this is the angular bisector of ABC. Step8: With C as center, draw arcs of same radius to cut the sides CA and CB at W and V respectively. Step9: With W and V as centers and with more than half of WV as radius, draw arcs to intersect at X. Step 11: Mark the point of concurrence as I. Note that three angularperpendicular bisectors of a triangle are concurrent and they meet at I. 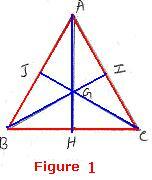 The point of concurrence of three angular bisectors of a triangle is called ‘Incenter’ and is usually denoted by ‘I’. Step 2: From I, draw perpendiculars to each of the 3 sides -AB, BC and CA and let they meet these sides at L,M and N respectively. Step 3: With I as center draw a circle of radius IL. The circle with Incenter of the triangle as the center and which touches the sides of the triangle is called ‘incircle’. OIGS stands for On India Government Services. It is for All (Altitudes) Indian (Angular) Middle(Medians) class People (Perpendicular bisectors). Note: In section 6.13 we will be proving concurrency of these lines. As discussed above every triangle will have four concurrent points. If that is the case. given a triangle shaped wooden object as shown in the adjacent figure, will it be possible to suspend the object in the air using a string passing through a point maintaining equilibrium status? If possible which is that point? The perpendicular drawn from the vertex of a triangle to its opposite is called altitude. In circle is the circle which touches internally all the sides of a triangle and its center is in center(I) which is point of concurrence of angular bisectors.